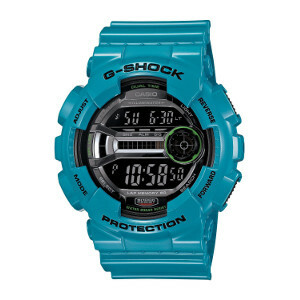 Have you heard of the latest G-Shock GD110 series? In case if you’re contemplating to buy the GD110 series, you must be asking yourself the question which of the GD110 watches to buy. The series offer 3 sub-series labeled as GD110-1, GD110-2 and GD110-7. What do they share in common and what do they differ in? The release of G-Shock GD110 series by Casio was targeted towards the running community. That is why you can expect all functionalities to be centered around the needs of a runner. Whether you are just starting out to get back on shape or you are a professional running, the GD110 series got you covered. First, there is the Lap Memory 60 that comes with fantastic stopwatch and timer. The stopwatch goes into 100-hour with 1/100 second accuracy. Then there is the 24-hour repeat countdown timer. If you are serious about running, you would be interested to keep track and monitor your performance. If you are gearing yourself for an upcoming marathon run, you need to keep track on yor progress over time. You need to know the time it takes you to run the same distance last week and today. You need to know when was the last time you run the 10 or 20km distance. Information such as these are definitely critical if you are taking the marathon challenge seriously and you are determined to complete the distance that you’ve signed up for, be it 10, 20 or 42 km. With memory allowing storage up to 60 records, you can easily keep track your running progress over 2 months time. While the running features are great, they do not come with heartbeat measurement. This is the biggest drawback of the GD110 series when compared to other running watches like Timex or Polar. So if you are looking for a watch that can help you monitor your heart rate, this might not be for you. The 3 models: GD110-1, GD110-2 and GD110-7 share the same great features and they differ only in colors. GD110-1 has a black resin casing with a hint of blue at the foreground. It is perfect for those who love anything but black. GD110-2 has a blue resin casing with a hint of light green at the foreground. It is perfect for those who love to be bold and different in style. GD110-7 has a white resin casing with a hint of orange at the foreground. It is perfect for those who love white and simplicity. 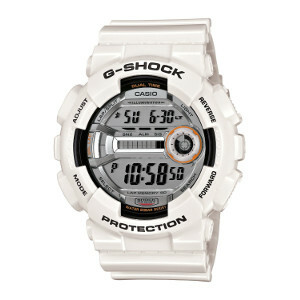 If you love the whiteness of GD110-7, we recommend that you take a look at some of the most beautiful and popular white G-Shock models. All the three – GD110-1, GD110-2 and GD110-7 – are great tough watches but they are nothing but different color variation of an otherwise identical design.